Thanksgiving is my time for desserts. I could honestly skip the cake anytime, and go without. Pie on the other hand is my kind of dessert. Sweet and warm fruit with a flaky crust then topped with whipped cream or ice cream… or both 😉 In my option there is no better dessert! Since I love apple pie so much I made it in several different forms. 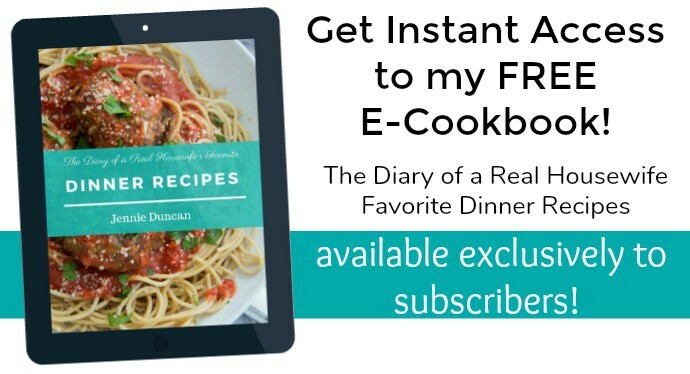 Make sure to check out all my favorites when you are down with this recipe. 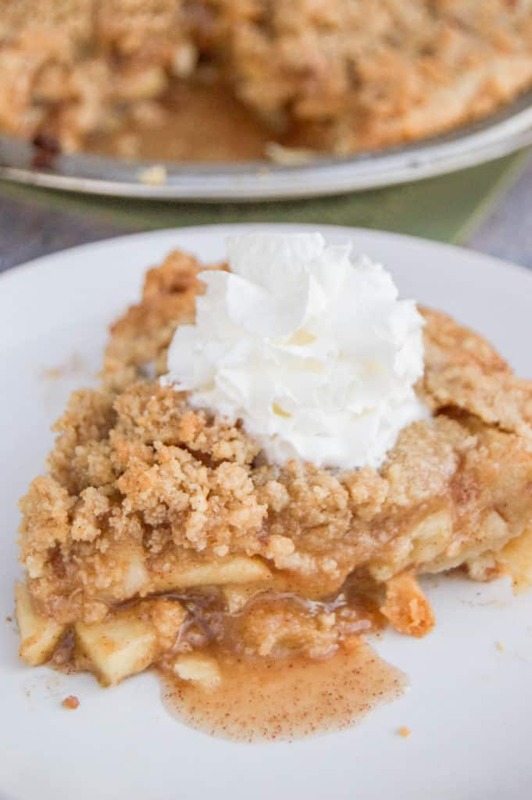 I love a good Classic Apple Pie Recipe, but this crumbly topping in this Dutch Apple Pie is so good I may have a hard time picking which one will be going on my table this Thanksgiving. I could make both Dutch Apple Pie and the classic, but I also want, cherry pie, chocolate pie, peach pie, pumpkin pie, oh have I mentioned that I really like pie? I hope my guests do as well. Step two: Roll our crust and place it in the bottom of a pie pan. Use a store bought or make your own. Step three: In a mixing bowl put all filling ingredients, and mix until apples are coated. Pour filling into crust. Make sure to only add the apples. You don’t want all the juice in the bottom of your crust. Step four: In a separate mixing bowl use a fork to combine all topping ingredients until the mixture is well combined and crumbly. Pour this onto your apple pie. Step five: Bake! Once cooked though you can serve it warm with ice cream or whipped cream. For this recipe I use a lot of apples. I mean a lot! My pie is over flowing and we love it that way. Some of my readers say that they use about a cup less then what the recipe calls for and it works perfectly for them. I would add the apples to taste. If you love the crust and crumble maybe do less apples or just add them until you feel the pie is full enough. Make it how you and your family will like it. Some has said that it is perfect while others love it with less sugar. Use your taste buds and if you like a less sweet pie then feel free to add a little less sugar. The video is below for those who want to watch. For this recipe I used a standard 9inch pie pan. Some readers suggest using a deep dish pie pan if you want to use all the apples while others say when using a deep dish pan you need more apples. Use your decrement on this one and add to your liking. If you have leftover apples then you can bake them separate and just eat them as a topping for ice cream! The topping calls for cold cold butter that will melt when baking. You want to add break up the butter into small pieces with the rest of the ingredients. You can use a fork but I also like to get in with my hands. Pinching the butter into small pieces and having them coated in the dry ingredients. 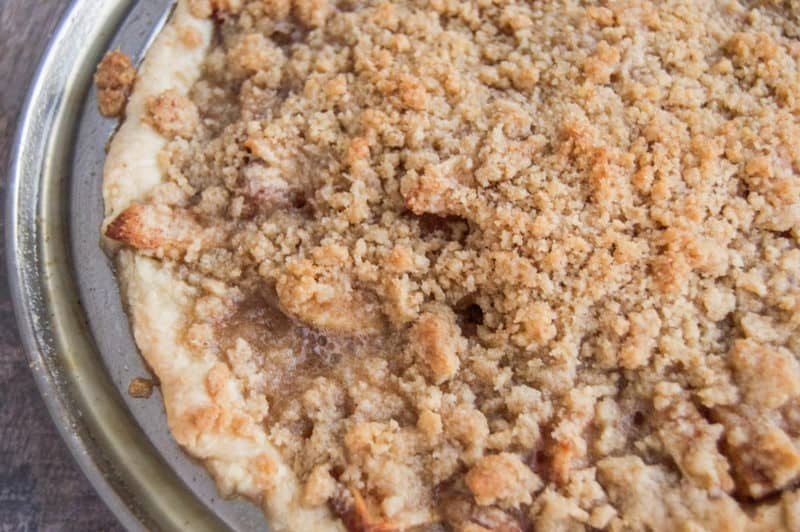 Make sure you have a small crumble before adding it to the top of your pie. Store bought or homemade crust will work fine for this recipe. Whatever you feel comfortable with. Most crust recipes and crust from the store will come with a top and bottom crust. For this recipe you will only need one crust since you will have the crumble topping. If you want to make a it homemade then try out my recipe homemade pie crust. It’s so simple to make and taste amazing! Pies can be now for bubbling up and spilling over. To help this make sure when adding your apples you do not place in the juice that is in the bottom. I would also suggest baking this pie on a baking sheet or placing a baking sheet under it. That way if you do have any drippings they don’t burn the bottom of your oven or make a mess. Once your pie is done allow to to rest for at least 10-20 minutes before serving. The longer it rest the firmer it will be and easier to serve. Roll our crust and place it in the bottom of a pie pan. In a mixing bowl put all filling ingredients, and mix until apples are coated. Pour filling into crust. In a separate mixing bowl use a fork to combine all topping ingredients until the mixture is well combined and crumbly. Pour this onto your apple pie. Bake for 50-55 minutes. Serve warm with ice cream or whipped cream. This is the best apple pie I ever made. Hands down. I think it’s best boiling down the apples before putting in pie. It guarantees no crunch in the apples. So happy to hear this and love the tip CC! Thanks so much for stopping by! This looks amazing! I have a bunch of pink lady apples that need to be used. Do you think I should reduce the amount of sugar since I’m not going with a tart apple? Yeah that would be a good idea to reduce the sugar by a little. It all depends on your taste also if you would like it extra sweet or not. =) I hope you enjoy the recipe!! Thanks for your response. I did end up reducing the white sugar to 1/2 cup. The pie was absolutely delicious! I also had some salted caramel sauce in my fridge that I drizzled over the top – yum! I am so glad you liked it!! Also salted caramel sauce!! Yumm, I am going to need to try that! Do you mean for the topping, *flour* 1 cup? Yes one cup of flour for the topping. 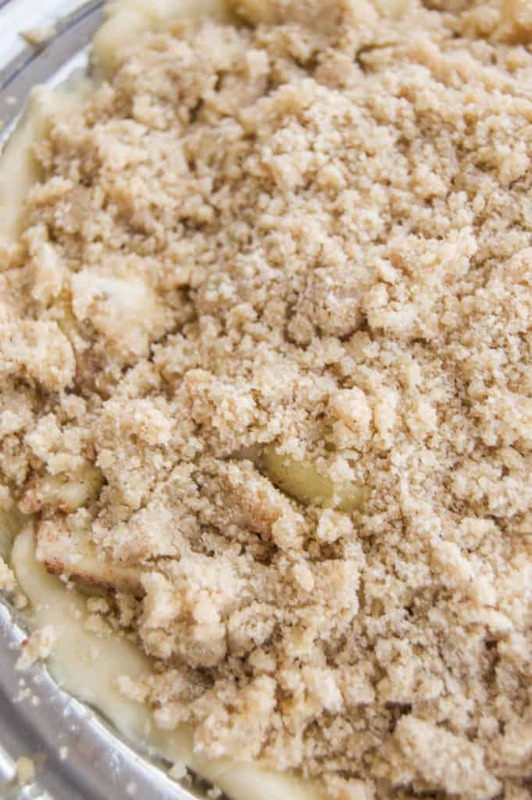 Work it in with the butter and other ingredients until it becomes a crumble. Hope that helps Chrissy! The pie was delicious but a little too sweet. Next time I will put in half the amount of white sugar. I made this last night for a birthday and everyone absolutely loved it (myself included!) I randomly found this on Pinterest but will be following you more now. Thank you! A small amount of lime would work but may change the flavor just a little. The lemon juice is really just to help the apples not turn brown and soft. I say skip the lemon and lime, add just a little LESS sugar and you should be good! The leftovers just may not last as long! omg I have never made an APPLE pie before mostly because they always have huge slices. I used this recipe exactly except I chopped my apples small, diced like. It came out amazing! cooked perfect and the taste is delicious! great recipe! I have no need to try a different one this is fantastic! Thank you for sharing your recipe. Awesome!! I am glad you enjoyed the recipe =) It’s one of my favorites!! Is this for two pies or one? Dumb question I know. The first time I put it in am 8×8 pan because I don’t have a pie pan. Today I am making it in a tin. Just seemed like a lot to jam in one crust? Maybe I am over thinking this. Thanks. Awesome recipe! Everyone loved it! It’s for just one pie. It does sound alike a lot but I like to really fill mine and it will bake down a little. You can always add less if you feel like it is over doing it for your tin. Hope that helps Jess! How many apples do I need to use? Depending on the size of your apple you will need about 8-10 apples for this recipe. I hope that helps Daniella, let me know how you like the pie!! Can you make this pie ahead of time and warm it up to serve later? Yeah! Just chili in the prepare and then before baking place in the fridge until ready to bake! Tried this recipe tonight. It was very delicious, with just enough sweetness. I didn’t have all purpose flour, so I used 00. In my opinion the topping turned out a bit too dry and too hard. I’m thinking it was because of the flour used. I Will definitely give this a second try with all purpose flour. Very yummy! Soo delicious! Made this tonight for dessert with friends and not a bite left…I’m going to make it again for thanksgiving! Thank you for such a yummy recipe! Yah! I am so glad you enjoyed it Azra!! Hope you all enjoy it on Thanksgiving as well! I’d like to make this for thanksgiving but I’d like to bake it ahead of time. Like the night before. Does it save well? How would you reheat it? Or would it turn out much better to bake it right before leaving? I don’t want to compromise the taste/consistency! You can always make the apple filling and even the crust and topping (all stored in the fridge) the night before and then bake in the morning to make sure it is crispy. That would save you some time. Lay out your crust in the pie pan and place it in the fridge with the filling and topping on the side. Put it all together an bake the next morning. This way you it will taste fresh but you got all the work done before. I hope you enjoy it Kelsey! I am making this for the first time (lord help me), but this might be a crazy questions but do I not need an apple like filling? And for the butter, do I need salted or not salted? Nope the apples are your filling. The flour will help it get that pie like filling when baking. I use unsalted butter because I like the pie sweet but it’s mostly personal preference. Good luck Tayler! I hope you enjoy the pie, you will have to let me know how it turns out. I’m so excited to see how this turns out! If I prepare the filling night, is the lemon juice enough to keep the apples from turning brown? If you are preparing this and keeping it in the fridge overnight I think you could add 2 tbsp of the lemon juice. Give them a really good mix so they are all coated. Hope you enjoy the recipe Dayan! Made this pie today to take to our friends’ Thanksgiving feast. Had the best compliment on it from my husband. He said it tasted just like his mom used to make. Sadly, she passed in 2015. Thanks for the recipe and for bringing a little bit of “home” to our Thanksgiving. Hope you have a wonderful holiday! Made this apple pie yesterday and it turned out wonderful. I had extra pie crust dough from making a Thanksgiving pie and I didn’t want to waste it, so a dutch apple pie was in order. I used Arkansas Black apples, which gave the pie great apple flavor. It was easy to make and looked gorgeous. Great recipe, that I will be keeping in my recipe board. No you will not need to cook it ahead of time. Just bake with the filling inside. Hope you enjoy it Suzanne! I’m going to use store bought pie crust, do you only use one crust for the bottom & another for the top & then sprinkle the topping or do you just sprinkle top topping on top of the filling? Hi, I’m going to be preparing this on Christmas Eve, can I prepare everything and just bake it on Christmas Day or would it be best to cook it then warm it up before serving? Also, the butter for the topping, should it be cold from the fridge? You could. I would cook it, all and then allow it to cool, place in fridge, and reheat in the morning. If you want to really make sure that your crust does not get soggy you can lay out the cast in the pan the cover and place it in the fridge. Prepare the insides and place in in a container and your topping in another. The next morning just toss it together and bake. Hope that helps Lynn! Hi! I see a comment about boiling the apples first but I don’t see it in the instructions. Do you boil them first? I would think 55 minutes would be enough to cook the apples. In a separate Practical Ecommerce post on conversion improvement, columnist Richard Stubbings makes the point that PayPal can provide a surprising boost to your conversion rate. I am sure our readers are really going to enjoy this recipe as much as we do. Keep up the good work, really love your recipes! Thanks so much for sharing!! I hope they love it! So it’s Pi day and you got to make pie. This was awesome. I don’t like tart apple pie. I prefer sweet deliciousness. I will be keeping this recipe because my husband ( who is picky as all get up) loved it and so did my quests. So awesome Heather! =) Thanks so much and glad you have some good pie on Pi day! Made this yesterday & it was delicious. Hubby loves Marie Calendar’s Dutch Apple Pie & requested one for his birthday. Since we were having guests for dinner I decided to try a homemade one. Everyone raved about it including the birthday boy. For those asking about freezing before baking I would freeze without the topping. Yah!! So glad that everyone enjoyed! Also happy birthday to your husband!! Does the butter used in the topping have to be cold or room temp? It should be cold. You have to really work it but it helps make is more crumbly then a wet and hard to use. I have to say this is one of my favorite pie recipes!! Best one I tried for sure. I’ve made several apple pies in my life and this one is hands down my all time favorite!!! My husband loved it! This was so delicious! Mine had quite a bit of liquid in the bottom though – and not a syrupy thick delicious liquid – but a thin watery liquid. What should I add or reduce next time to soak up some of that liquid? I made two of these pies and took them to my staff at work! They were a hit! Came home and made another for my husband! We have a plethora of apples from a trip to the farm! What a wonderful way to use them up! Thanks for a great recipe! Yah! So happy to hear that Cathy!! I intended to make 2 different pie recipes using my split pie pan. I reduced the recipe in 1/2 and peeled and diced 2 apples since it it not a very deep dish. However, when I went to pour the apple mixture in the pie pan, it filled both sides of the pie pan very high. So I made a full recipe of the crumble and cooked the pie as required. The pie tastes good but wonder how it could possibly accommodate 8-10 apples. Hi Sharon, I might pile mine a little to high but we love it that way. Sorry if that caused you to make to much. If you have any leftovers I would bake them separate and eat them as is. I love just eating the filling. I am so glad you liked the pie though! Thanks for the comment so others can know!! I appreciate it. I made this tonight using this recipe and your pie crust recipe. The apples and crust were completely done. It was SO good! My boyfriend loved it! Your instructions were easy to follow and made my first pie (ever, and from scratch) a hit! Yahhh!! That makes me so happy! I was so scared to make pie and crust from scratch for so long. It was a few years ago I just went for it and I was so surprised at how simple it was. So glad you went for it and loved the recipe! This was so easy and do good! I’d post my pic if I could but don’t see how I could do that! I made mine in a rectangular pan and cooked a little longer since it was thick. Loved it! Will it be okay if I use a mix of granny Smith apples and red apples? I don’t think I have enough granny snith apples! Yes! That will be fine. Red are a little sweeter so you may want to do less sugar or just to taste. When you bake it then it should be okay and not mushy. Also lemon juice is okay! I made this and it came out a little runny. I’m not sure if I did something wrong, but it still tasted good. Do you know of a reason to why it would be runny? Thanks! Hi Laure, I find it to be runny if I let the juice from the mixing bowl into the pie crust when adding the apples. Glad that it still tasted good! 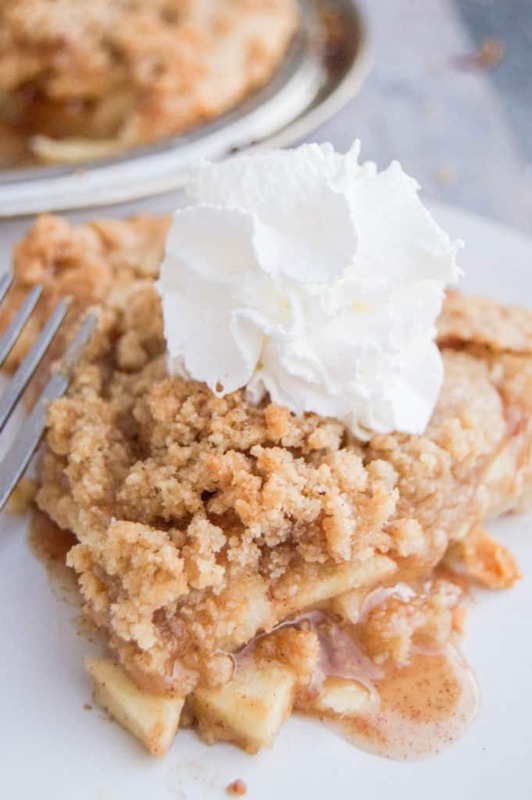 This is my husband’s favorite dessert, and because of this recipe he won’t order apple pie anywhere and instead begs me to make it instead. I was able to bribe him into doing a full on KonMari of his office/den space in exchange for me making this. I’ve also made this in muffin tins, which he takes to work. You just made my day Natalie!! I LOVE that y’all love this recipe so much. Thank you for coming back and letting me know!